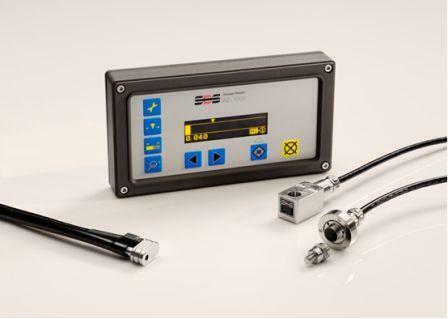 The AE-1000 is the dedicated 2-channel gap and crash controller from SBS. The AE-1000 reports initial contact between the grinding wheel and a new part to the machine control system, so that it can stop wheel in-feed without operator intervention. This can save up to 20% of the typical cycle time. It is simple to use, and features an OLED graphical display with universal icon-driven firmware. It can also detect and report abnormal contact from an incorrectly loaded part of fixture within milliseconds (crash control), allowing the in-feed to be stopped, avoiding a crash, damage or injury. 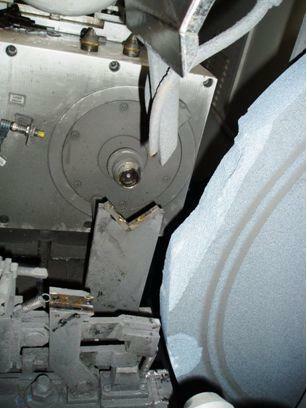 Pic: Typical damage to a grinding machine that was not fitted with an acoustic gap and crash control. This was caused by an incorrectly loaded fixture. Position control, used to zero the machine before a grinding or dressing cycle is possible by detecting the edge of the wheel touching a reference point known to the machine CNC. The CNC can therefore determine the exact position and diameter of a changing grinding wheel. The AE-1000 works with a variety of SBS acoustic sensors, all of which are easy to retrofit.